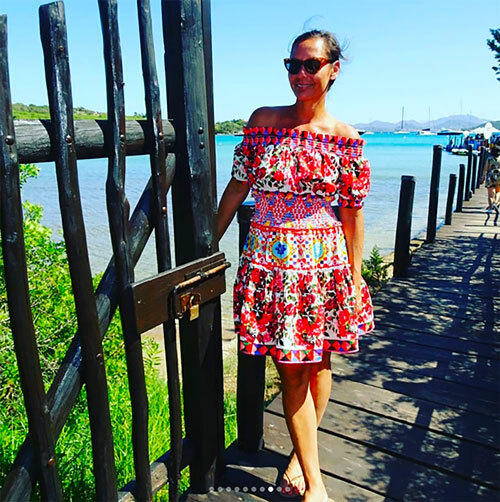 We stayed at the white-washed Mediterranean-style Hotel Romazzino, perched on a hill overlooking the clear blue waters off Costa Smeralda. The beachside set-up, above, called for lots of lounging around. I tried to counterbalance my lounging/carbo-loading at the hotel's epic outdoor gym, but miserably failed. 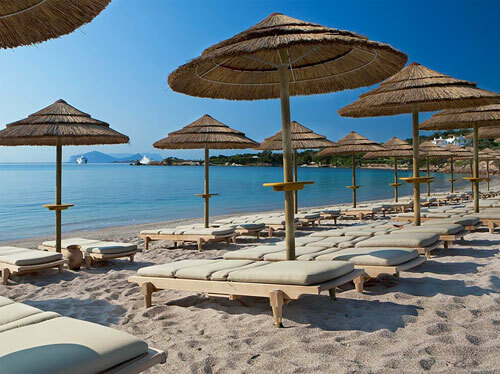 For us, every day in Sardinia was a beach day, but just a different beach! By boat, we sought out the most secluded ones we could find. Our favorites were sprinkled around Cala de Volpe. As we beach hopped and soaked in the sun, I went through several bikinis and dresses a day. My fringed dress is by Love Shack Fancy (I love that it can be buttoned/unbuttoned all the way) and my polka dot suit is from And Other Stories. 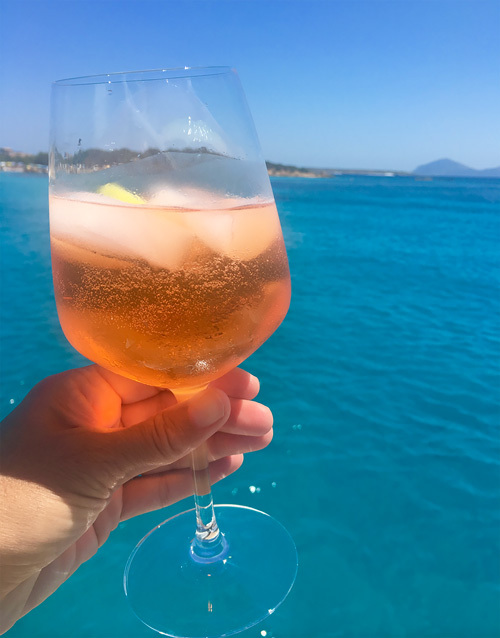 The best Italian aperitif--and my new summer drink: an aperol spritz! So refreshing and light. That almost all of us had packed a wrap skirt is a testament to its greatness! Mine is by The Reformation and several years old, but my friends sported some new, just-out versions by Lisa Marie Fernandez, Dolce & Gabbana (on sale! ), Milly, The Jetset Diaries, and The Reformation. My tie-trimmed one-piece is Minkpink. The Med doles out mind-blowing blues! 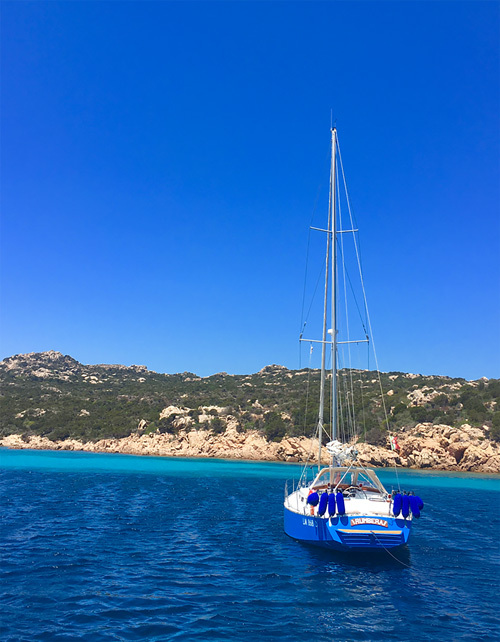 One day we boated to La Casitta, a small restaurant hidden away on a private, uninhabited island called Santa Maria. After we arrived at the unmarked stone platform dock, above, we were whisked away on a golf cart to the restaurant, a renovated shepherds' home built in the '20s, surrounded by wild gardens. We feasted on fresh-harvested clams, oysters, sea urchins and, yes, lots of pasta. My floral-themed ensemble--a Natalie Martin cover-up and La Reveche bikini--helped me blend in with the scenery! 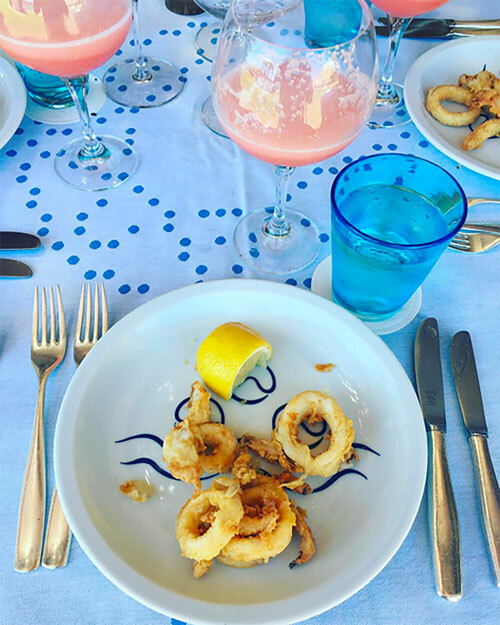 This stretch-waist, off-the-shoulder Stylekeepers dress served me well post-lunch at Cala de Volpe, where I gorged on the best truffle pizza, fried calamari and bellinis ever (below)! I'll definitely need this dress in my next life! Amazing! Would love to go! What size did you take in the LoveShackFancy dress? I bought a size medium in the Love Shack Fancy dress. Hi!!!! I love the white sunnies you wore. Who are they by? Thanks!